The rugged, dusty surface of Novus-147 had been the view outside the windows of our lander for the last 3 days. The five of us who were scientists had completed most of our respective samples and tests. The mission had been very uneventful, and I suspected the five Marines, assigned to shadow each of us as we worked, were bored out of their minds. In our evening transmissions to the orbiting USS Calypso, the exploratory vessel we belonged to, we’d been reporting increasingly positive signs that this planet could support human life. As with most planets humans had colonized, it would require a few settlement adjustments for the conditions that differed from our native Earth. The atmospheric makeup had been the first test results Dr. Campbell, an older man and our chemist, had given us. The air here was breathable and very oxygen-rich. We’d been able to complete the rest of our tasks with our helmets attached to our utility belts rather than on our heads. It was a thrilling experience, breathing an alien atmosphere. Today, the fourth and last day of our surface mission we planned to set out in search of water. Dr. Campbell’s atmospheric tests had shown high levels of water vapor in the air, and according to our geologist there were signs the planet’s surface had liquid water somewhere. We had yet to confirm or locate it. The Calypso was performing scans from their position in orbit, but this hadn’t turned anything up yet. We knew from our planetary assessment training that it was possible for water to hide in the unlikeliest of places, so we had decided physically combing a radius around our landing site was the best option. We set out early from our small valley, heading for the foothills and larger mountains. We all stayed within eye-sight of each other and had instructed the Marines in what to look for as well. “You’re telling me!” The lieutenant frowned. He was a comms specialist, and was already checking settings on the small comm screen on his wrist. “Huh,” he said a moment later. Then silence. Then we lost the connection. We all turned to look back at the lander we’d left behind us. Beyond it, we saw something so familiar it was shocking. “Daaang! That’s a thunderstorm! An alien thunderstorm!” yelled Shawnta Jackson, another of the Marines. “It’s not surprising, given the humidity levels I logged,” Dr. Campbell was muttering under his breath. “This blast of radiation must have kick-started it.” He fumbled in a pocket of his suit for something — probably a testing device of some kind. We all sprang into action, running across the silty terrain as fast as we could. While our suits weren’t as bulky as Earth’s early astronauts used, this particular model was not the greatest for easy running. I was grateful for the oxygen-rich air. Before we’d gone very far, Adam, my Marine guard, shouted a halt. “We’re not going to make it! Look!” The towering cloud and the dust it was kicking up loomed just beyond the lander, dwarfing it. The man was right. There was no way we’d make it back to the lander and take off before that thing enveloped us. A couple scientists stared reluctantly at the lander that had been home to us for the duration of the mission. It did feel as if it should be the safest place. “NOW!” several of the Marines bellowed. We had just reached the foothills when we heard the scream and shriek of metal being torn and crumpled. Taking a quick moment to glance back, I saw our lander tossed into the air like a piece of scrap paper. Then the storm enveloped and hid it. He gave a tight nod. Ahead, Dr. Sicily Graves gave a shout and waved her arms. She pointed up and to the left of us. “There’s a cave!” she yelled, cupping her hands over the noise of the impending storm. I was never more grateful to have a geologist on hand. We all made a beeline for the peak and the cave in the side of it. The 10 of us collapsed on the floor, panting. “Are we really safe in here?” I asked. “Because of aerodynamics, though, we should move back in the cave,” our physicist said, scrambling to his feet. We switched on the lights built into our suits’ sleeves and pushed further into the cave. It extended pretty far back before branching off into a lower cavern. We scrambled down some jagged rocks and lowered ourselves into this new area. Overhead, the wind screamed with a fury and small dust particles filtered through the air, visible in the beams of our armlights. I’m glad I noted the time on my comm screen when we got there. Otherwise, we might have gone crazy not knowing how much time had passed. As it was, we were astounded by the sustained length of the storm. Thankfully, despite small amounts of dust filtering in, we seemed to be safe. After 12 hours, during which we’d shared some energy bars and carefully rationed the water pouches we had with us, the noise above us began to lessen. Several of group had laid down to catch some fitful sleep. I wasn’t one of them, so I noticed the change in the weather. Adam slept nearby on the hard floor of the cave. As the noises of the storm faded, I got to my feet. If I stood on some of the rocks we’d climbed down, I should be able to see into the upper cave and perhaps out the mouth of it. With a start, Adam sat up, instantly alert. “What are you doing?” he asked quietly. After a little scrambling and some help from Adam, I got to the top. A fine layer of silty dust covered the floor of the upper cave, visible in the muted light coming from the cave’s entrance. Something shiny snaked its way across the dust, pooling in a low spot in the floor. “Is that — ?” I asked. We moved closer with our lights trained on the floor. “It sure looks like water,” Adam said. We wouldn’t know for sure until we had time to run tests, but it appeared that tiny rivulets of water were running across the dust and pooling in the cave. “It rains here!” I nearly shrieked in excitement. “That’s where the water comes from! It rains!” The planet was officially habitable. I couldn’t wait to tell the Calypso. Something wasn’t right about the light coming from outside, though. I went to the entrance of the cave. The air was nearly still, but I could see nothing. A thick, tan-colored fog hid everything from view. I reached my hand forward into it and watched in surprise as it became hard to see my own fingers. I drew back and nearly bumped into Adam who, as usual, was right at my elbow. “This fog… it’s full of dust. And there’s zero visibility.” I turned to look at him. He gave a tight nod. “Yes. We need to check in with the Calypso. It sounds like they might be in distress too from the radiation blast out there that started this whole thing.” He donned the space helmet that had been hanging from his utility belt. Locking it in place, he powered up life support systems. We did a quick comms check to be sure we could communicate with one another, and then he handed me one end of a length of paracord. He tied the other end securely to his belt and dropped the extra on the floor between us. “Understood, sir! We’ll make sure you get back in here safely.” She joined me near the entrance. “Weird fog,” she commented as it swallowed Adam. I watched the length of cord play out, holding my end determinedly. In a moment, we could all hear Adam’s voice in our earpieces, “This is Lieutenant Carter to Calypso. Do you read me?” There was a short pause and I watched more of the paracord disappear into the brown fog as he moved further away. Adam repeated his call to the Calypso and this time my heart sank. His voice was no longer crystal clear. It crackled with static. What was going on with our comms? The paracord moved, and I strained my eyes searching for a hint of him in the fog. It wasn’t until he was right at the cave’s entrance that I saw him. The fog grew dark shortly after, and we all headed back down to the lower cave to wait out the night. By morning, the fog had mostly cleared and we donned our helmets before venturing out of the cave. Standing in the row in the early morning light, we looked down at the surface of Novus-147. It was coated in a new layer of silt. The center of the plain we’d landed on was now a lake filled with the runoff from the mountains and hills. Dr. Campbell was already measuring humidity and reported it was lower than he’d seen the whole time we’d been there, but it was rising rather rapidly. “My theory,” he stated, “is that all of the planet’s water is usually contained in the air, much of it higher in the atmosphere until one of these storms’ precipitation empties nearly all of it onto the surface. It is then quickly evaporated and returns to the air before it can sink into this strange dirt.” He glanced at Sicily, the geologist. For the first time, we all looked at the landing site. The lander wasn’t there. It was some distance away on a small foothill, half buried nose-first in the ground. Both wings were broken off near the hull. It took us nearly an hour to get to the lander’s new position. Dr. Campbell and his guard went to the rapidly evaporating lake to collect water samples. The rest of us worked the better part of the morning to find a safe way to enter what was left of the lander. By evening, we’d managed to salvage only a small amount of equipment — most of what was onboard had been too delicate to take the smashing the craft had endured. I was eternally grateful we hadn’t been aboard. We would have died within the first minute or two, I guessed. Luckily, most of the freeze-dried food was intact. We had all been subsisting on nothing more than power bars for the last 34 hours or so. As the daylight grew dim, we sat just inside the jagged opening in the lander’s hull and ate a full meal. Freeze-dried food had never tasted so… adequate. Adam wasn’t with us, I suddenly realized. It was something of a shock since he’d been right by me every time I’d turned around for the last 4 days. I walked outside, looking for him. To my surprise, he was on top of the wreck. “What are you doing?” I called up to him. He waved and motioned for me to wait. In a moment he’d scrambled down. Running his fingers through his short, cropped hair, he said, “I was working on the radio relay. I’ve been trying to get it running again.” He looked at me solemnly. It was as if someone had died. “Did it work?” I asked, already knowing the answer. We stood in silence and sought out the exploratory vessel just now visible as a tiny grey speck in the fading light near the horizon. “Wow,” I sighed. For a moment I couldn’t think of anything else to say. I followed him into the lander, brushing back some tears I was unaware I’d shed. Although he said it aloud, it was still a shock a little later in the evening to see our ship accelerate out of Novus-147’s orbit. Dr. Campbell was the most visibly distraught. He had a wife and grown son back on Earth. He, like all of us, was coming to grips with the fact that we were likely never going to set foot on our own planet again. We all conferred in hushed whispers, going over the reports we’d sent back to the Calypso and the discovery of both the water and the planet’s harsh weather. After a few minutes, we had concluded survival was possible, although hard without any outside assistance and very little technology. This wasn’t a death sentence. It was a small comfort, though, and I don’t think anyone slept that night. The next day dawned bright and golden, the alien planet’s sky above us and its dusty, rugged landscape before us. We ate mostly in silence, contemplating our situation. “Will it ever feel like home?” I asked Adam, when the Marine sat down at my side as usual. Still protecting me. I nodded. “The human race is pretty adaptable, though. We’re like the American pioneers, I guess.” Perhaps Adam would make contact with someone and we’d all end up going home. Perhaps the 10 of us were the start of something new. “Like a nest,” I whispered, catching her meaning. “Yes, a nest,” she said. The rest of our group nodded in agreement. “That’s Nidus in Latin,” she added. We all grew still as we realized Novus-147 had just been given a real name, something that was only done upon colonization. The population of Nidus started at 10 and within a few year grew to 15 as marriages among the scientists and soldiers took place and a new generation was born. Lieutenant Adam Carter and his eventual wife, the scientist Janeen, continued working on a radio system until his death. Their daughter, Aster, continued his work. When she was middle-aged, Aster finally made contact with a passing freighter. The vessel relayed the news to Earth that their long-ago lost team had survived, and a tiny but thriving colony of hardy individuals had grown up on Novus-147, now called Nidus. Earth rerouted a ship to make contact with them. The close-knit settlement on Nidus, though living in rustic conditions similar to the old American West, was content. They were happy to be on the map and to receive occasional visits from wandering trade ships, but they had no desire to leave. They stayed on and continued to tame the wild and dusty planet they called home. This story is part of Mydlands, a Creative Commons sci-fi universe created by Perry Elisabeth Kirkpatrick. 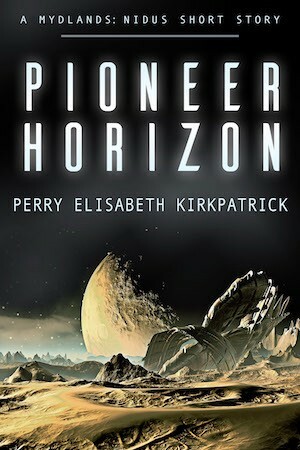 Pioneer Horizon tells the origin story of the planet, Nidus, and its original settlers. Read more about Mydlands at: http://mydlands.wordquill.com/. Read more about Perry’s works at: http://perrykirkpatrick.com.